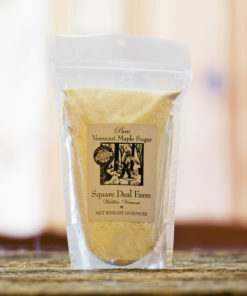 Square Deal Farm is remotely located in Vermont’s North East Kingdom. We are surrounded by wild lands and bordered by an eleven-thousand-acre wildlife preserve. Our soil and water are pure, clean and rich in TASTE OF PLACE. 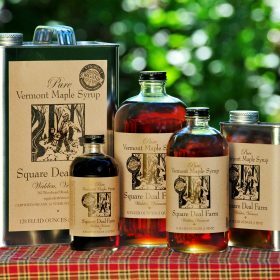 Our pure Vermont organic maple syrup is SINGLE SOURCE. It’s all made here on our farm from trees we know and love. 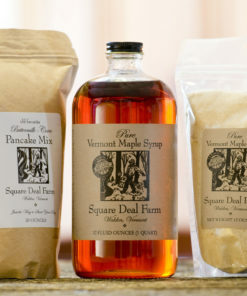 Maple syrup comes in several grades and varying quality. We bottle only the HIGHEST QUALITY syrup which is BATCH-TESTED for flavor and TRACEABLE to the day of production.Our syrup is CERTIFIED ORGANIC which not only ensures freedom from chemical additives, herbicides, and pesticides, but also evidences our commitment to sustainable agriculture. 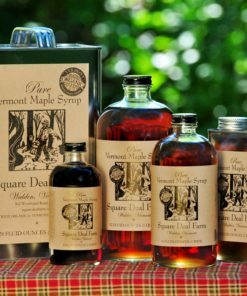 Vermont maple syrup must be bottled at a temperature of at least 180° F. We never put hot syrup into plastic. We bottle into FOOD-GRADE TIN or GLASS only. Sugaring is part of our DIVERSIFIED FAMILY FARM. We live and work here. 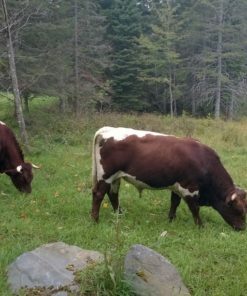 We also raise Pinzgauer, tend bees, grow apples and harvest our own hay. And, we manage our forestland for timber, wildlife and, of course, maple syrup production. When you want to GET IN TOUCH, you can. And when you can VISIT, give us a call. We’d love for you to see where your maple syrup comes from.